“You need the right tools to do a job right” International Patents and Standards Certification Chiao Teng Hsin Enterprises works hard to make sure that all of the products it develops, designs, and manufactures receive international certification so that its products can be used safely all over the world. Therefore, all of the company’s products meet TÜV/GS, BSI, ANSI and EN131 standards. 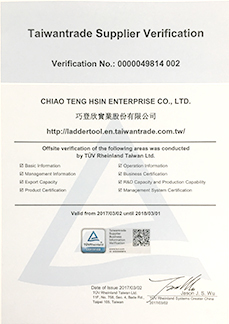 The load strength of the ladders already meets the criteria of international patent and certification bodies. Our efforts in this area allow all our products to be sold around the world without restrictions. Currently, Chiao Teng Hsin Enterprises has applied for dozens of patents for its products, and there will be more to come in the future. 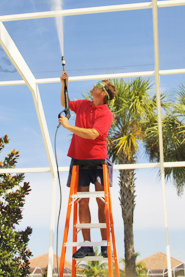 The company’s position in the world of aluminum ladders is thus firmly established. 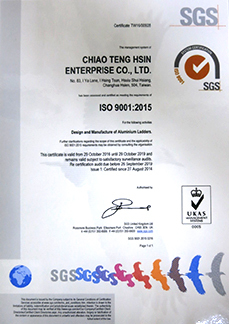 In addition, Chiao Teng Hsin Enterprise Co., Ltd has certification in ISO9001 system from SGS Taiwan. We believe to provide the excellent products with high quality are the only way to prevent the damage from the people.